On my way to the stars. The wizard waves his wand. The madman in my mirror. He's with us to the end, oh yeah, yeah. I can't see for my tears. 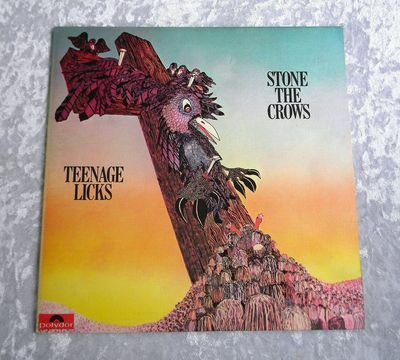 STONE THE CROWS: "Teenage Licks" LP, VERY FIRST UK PRESSING, RELEASED DECEMBER, 1971.
not find a Mint UK first pressing of the outstanding "Teenage Licks," unplayed was beyond my expectation... but here it is! a record with ' A // 1 & B // 1,' was very first pressed, but and only accurate method. MASTERED THE FIRST PRESSINGS OF "Teenage Licks." LIGHT AGEING, EVEN THAT IS MOSTLY FROM WHEN THE POLY-LINING WAS GLUED ONTO THE ABSORBENT PAPER. UNPLAYED RECORD. THE INNER SLEEVE IS IN EXCELLENT+++ / NEAR MINT CONDITION. OUTSIDE AND INSIDE BOTH PANELS. rubbing, the same applies to the edges and corners, it was kept in a plastic outer sleeve and it prevented the usual heavy wear. the inside is immaculate, grading embossed, textured covers of this age is never easy, but my pictures say it all. THE COVER IS IN A MINIMUM OF EXCELLENT+++ / NEAR MINT CONDITION. THE LABELS ARE LITERALLY LIKE BRAND NEW WITHOUT ANY SPINDLE ALIGNMENT TRACES, SO IS THE VINYL. THE RECORD IS IN UNPLAYED MINT CONDITION. which I will not do with the rarity of this ultimate condition first pressing, it must be respected. BEGGARS OPERA Act One LP 1970 VERTIGO 1st Press! AWESOME!! PLAYED ONCE!!! !